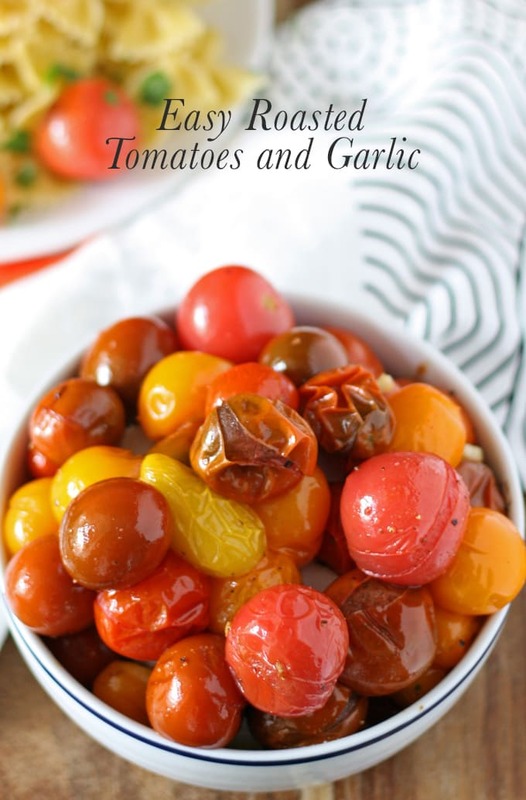 Easy roasted cherry tomatoes and garlic – perfect as a side dish or on top of pasta! 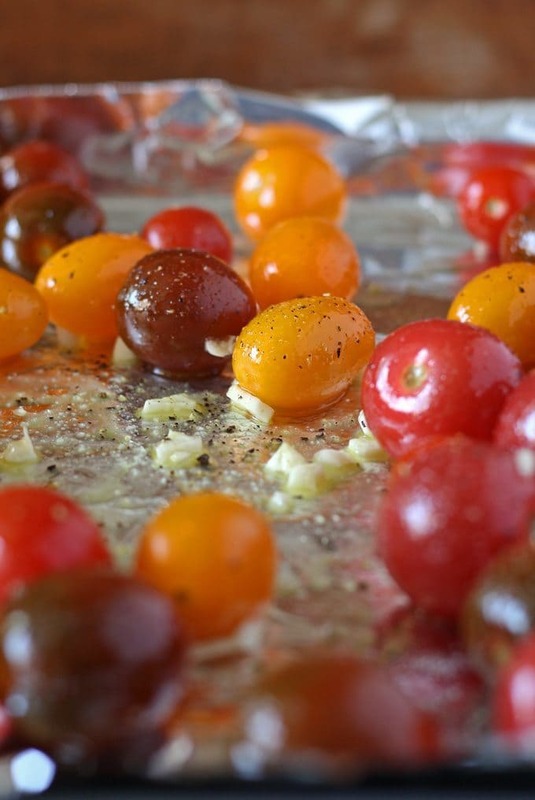 Today I’m sharing a recipe for easy roasted cherry tomatoes and garlic. It’s so, so yummy. I meant to post this back at the end of tomato season and then forgot I took the pictures. Who needs to get more organized? This. Girl. 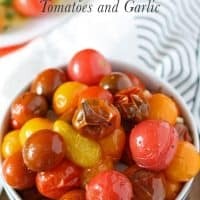 I started thinking about tomatoes today because of this recipe. One of my all time favorite regulars (back when I was a bartender in the not too distant past) had a serious aversion to tomatoes. Like, a throw-my-burger-out-the-window-cause-a-tomato-touched-it kind of aversion. And I always thought this was weird because I’m a huge fan of tomatoes. Tomato soup and raw tomatoes. Tomato sauce and tomato paste. Tomato juice (omg I love tomato juice) and bloody Mary’s with tomato juice (no V8 for me). But I do NOT like ketchup. Was my customer who hates tomatoes the weird one, or am I? I have talked about some of my odd food tendencies before, but this thing I have against ketchup still throws me and other people. I sometimes blame it on being from Chicago. If you know a little about Chicago, it might be the blasphemy of ketchup and hot dogs that caused my dislike. Ever since I ate my first Chicago-style hot dog, I haven’t enjoyed traditional ketchups. I even prefer to eat fries with mustard. Yes, I’m definitely starting to think that I am the weird one. Luckily for all of my fellow tomato lovers out there reading this, I’ve got the recipe for you. One of the perks of the grocery stores of today versus the grocery stores of my childhood is the wide variety in the produce section. I remember when I was a kid, you would go shopping for tomatoes and just get tomatoes. Nowadays, there are some serious options. 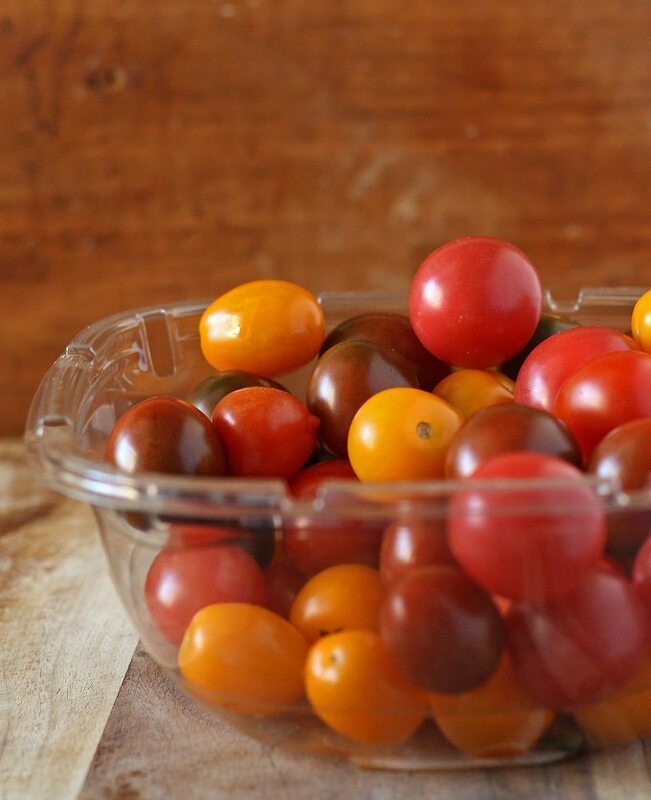 Like this package of cherry tomatoes I used for these pictures, in all the beautiful colors of heirloom tomatoes. I could not stop myself – I had to buy them.That kind of impulse usually gets me in trouble but not in this case. In this case, I roasted them and we piled some of the roasted tomatoes and garlic over some cooked pasta for lunch. And then we ate the rest of them alongside some chicken for dinner. It was a happy food day – simple, delicious flavors sometimes make the best meals. Preheat oven to 450 degrees. Cover a baking sheet with foil and drizzle 1 tablespoon of olive oil over the foil. 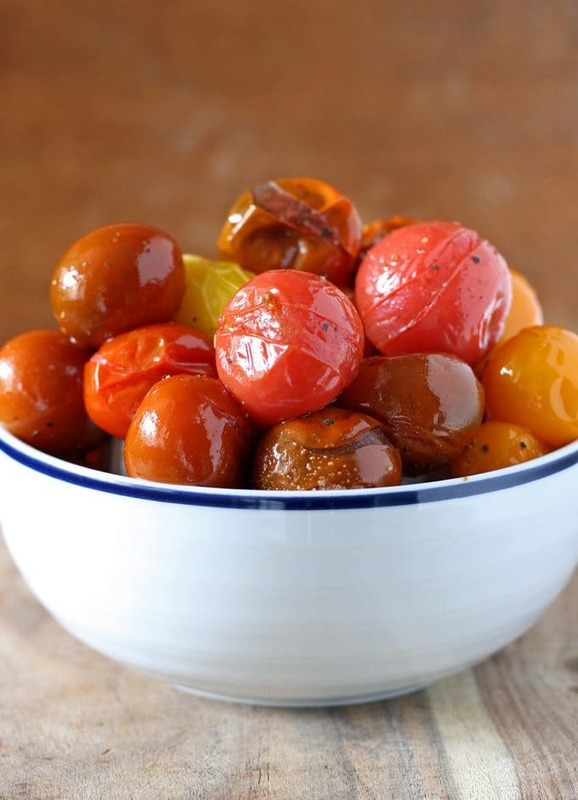 In a medium bowl, combine the remaining ingredients and toss well until the tomatoes are completely covered in oil. Pour the tomato and garlic mixture evenly over the foil. Bake in the oven for 10-15 minutes, or until the tomatoes begin to crack. Remove from oven and serve alone or over pasta. Well, now isn’t that easy? I’m so glad I found it over at Allrecipes. I saw those tomatoes and ran to the checkout – totally without a plan. And then I found one. I LOVE roasting tomatoes! I usually do them with a cilantro paste and go Mexican with them, but I have roasted and thrown them over pasta. This time of year I especially love roasting because the tomatoes just don’t taste like they did in the summer. Now I am craving them…your pictures are stunning! Pinning and yumming, and I will share them on Facebook tomorrow too! ‘m going to be making this soon! Oooooh, Michelle – cilantro paste and tomatoes sounds delicious. 🙂 And thanks for the compliment on my pictures – taking better pictures was my goal for 2014. 🙂 Love your link up! Yum! I grow tomatoes and now I can’t wait till next summer. I will probably make this recipe once a week. It’s the perfect recipe to add to a weekly rotation. 🙂 Summer is right around the corner! 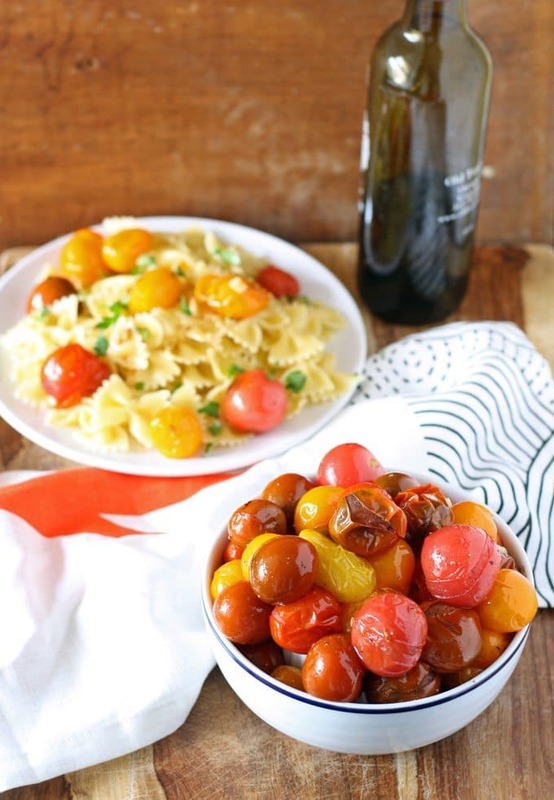 Love roasted tomatoes, and they look so pretty with the bow tie pasta. Sign me up for a plate of that!